IELTS Writing | 123 Getting ideas for Writing Task 2 – Essays about politics. In this tutorial we will look specifically at getting ideas for IELTS essays about politics, we will then look at the collocations you can use to boost your score. If you are stuck for ideas, then you need to fill your head up with information about politics. Watch the TED Video below. To get the full benefit from this you will have to do the exercise, so grab a pen and let’s get started. I want you to go through the questions below and come up with ideas for each essay question. We are going to improve and develop our idea generating skills. This is an essential part of writing effective Task 2 articles. Go through each question and try and get ideas, and back them up with examples if possible. You really just need two ideas, then from these ideas we build the body paragraphs, then the introduction and conclusion. It’s really quite simple. If you need a simple essay structure for your ideas, then check out this online IELTS course. Here is a quick tip: Simplify the question, what is the question saying? Some believe that politicians are the most influential people in the world, while others believe scientists are the most influential. Which side do you agree with and why? Provide specific reasoning for your answer. Who are more influential, scientists or politicians? This is a valuable to skill to develop because once we are clear about what we will write, we can develop ideas and start planning the our essay. Try and simplify the questions below, THEN develop your ideas. 2. How can the government of a country prevent illegal drugs from entering the country? Explain your solution to this problem and provide specific examples and reasoning. 3. Many countries have different priorities when it comes to what they spend most of their time focusing on. While some countries focus on healthcare and education, other countries focus on infrastructure and employment. Out of these two compounded areas of focus, which do you find to be most beneficial? Provide ample details and examples for your answer. 4. People in developing countries have a positive outlook when it comes to economic growth, while people in developed countries do not have this same positive outlook. Why is this so? Explain with specific examples. 5. Many people in many countries prefer to shop in supermarkets as opposed to small, local shops. What is the developmental effect of supporting supermarkets instead of local businesses and how does it affect the local economy? Provide specific examples and reasoning. Why is our inability to create and sustain economic growth the challenge of our time? What are the three key drivers of economic growth according to Dambisa Moyo? While they don’t need to grow as fast as developing countries, why is it important for developed countries to continue growing economically in the future? What is capitalism and how does Dambisa relate it to economic growth in her talk? Explain. What is Dambisa’s fundamental message to people on the topic of economic growth, why it has stalled, and how we can fix it? Economic growth – Economic growth is the main goal in developing countries in order to improve the way people live. Private sector – The private sector of businesses has more money than the public sector. Fundamental question – The fundamental question of the day is whether or not it will rain. Developed economies – In developed economies, people are able to live in peace because the government has money to spend. Emerging markets – Emerging markets in small countries can help increase their economic growth. Financial crisis – The financial crisis in the United States caused our economic growth to be destroyed. Human progress – The invention of computers has contributed substantially to human progress. Practical experience – You will need practical experience in order to get a job with construction because they don’t want you to hurt yourself. Social programs – Social programs such as the use of food stamps in the United States help poor families in need. Living standards – The living standards in small African countries in much lower than the living standards in developed countries such as the United States. Broad minded – Broad minded people need to be leaders in every country in order to appeal to all the people and their different mindsets. Dominant ideology – The dominant ideology in Tennessee supports the idea that abortions should not be legal. Greater population – The greater population puts their faith in politicians to make important decisions for their country. 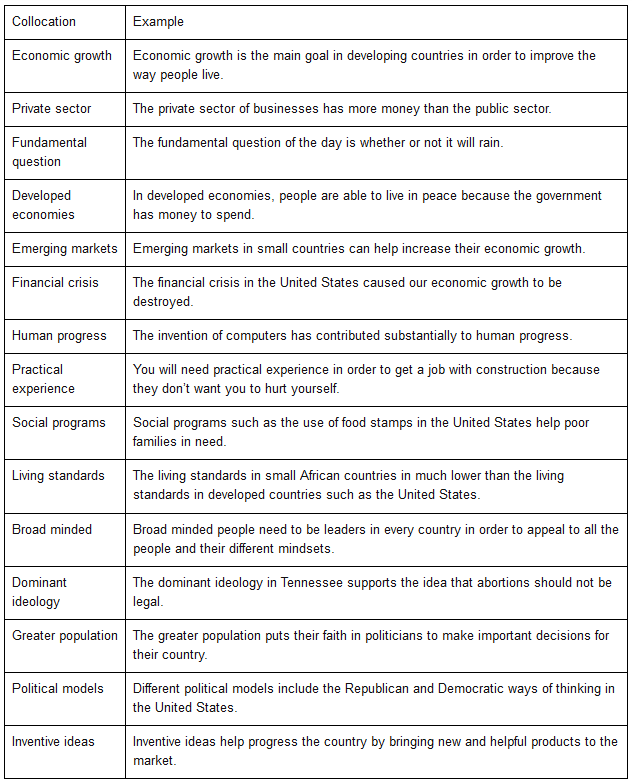 Political models – Different political models include the Republican and Democratic ways of thinking in the United States. Inventive ideas – Inventive ideas help progress the country by bringing new and helpful products to the market. The ___________ ________ is whether scientists or politicians are the most influential in the world. Both scientists and politicians bring forth progressive ideas in order to improve the ______ _________ for people in society. While politicians are responsible for many amazing changes such as the creation of ______ ________ to help the poor and _________ ______ that have created democracy and freedom, scientists have made discoveries that have fueled _____ ________ over time. Firstly, politicians can be considered more influential, because they are in charge of changing our laws and our way of life. While scientists make discoveries, politicians are the ones who distribute these discoveries and cause the people to embrace these _________ _____. For example, scientists discovered that global warming is a major problem in our world today, but politicians are the ones who take this problem, make it a ________ ________, and teach how to fix the problem. Therefore, politicians can be seen as the most influential people. Secondly, politicians can be seen as more influential because they do, in fact, have the most influence. Why scientists may be smarter and _____ ______ sometimes, politicians are well known and their job is to influence others and lead. For example, studies have shown that politicians are more favorable to scientists in the public eye, because they are trusted by their specific supporters. Politicians of all backgrounds have a set of followers who wholeheartedly believe in them and are influenced by them. In conclusion, politicians are more influential than scientists because they are well-known, followed by many, and are in charge of implementing and distributing the ideas of scientists to the _______ __________. The fundamental question is whether scientists or politicians are the most influential in the world. Both scientists and politicians bring forth inventive ideas in order to improve the living standards for people in society. While politicians are responsible for many amazing changes such as the creation of social programs to help the poor and political models that have created democracy and freedom, scientists have made discoveries that have fueled human progress over time. Firstly, politicians can be considered more influential, because they are in charge of changing our laws and our way of life. While scientists make discoveries, politicians are the ones who distribute these discoveries and cause the people to embrace these inventive ideas. For example, scientists discovered that global warming is a major problem in our world today, but politicians are the ones who take this problem, make it a dominant ideology, and teach how to fix the problem. Therefore, politicians can be seen as the most influential people. Secondly, politicians can be seen as more influential because they do, in fact, have the most influence. Why scientists may be smarter and broad minded sometimes, politicians are well known and their job is to influence others and lead. For example, studies have shown that politicians are more favorable to scientists in the public eye, because they are trusted by their specific supporters. Politicians of all backgrounds have a set of followers who wholeheartedly believe in them and are influenced by them. In conclusion, politicians are more influential than scientists because they are well-known, followed by many, and are in charge of implementing and distributing the ideas of scientists to the greater population.